At the Steinexpo 2014, the International Demonstration Show for the Construction Materials Industry, Liebherr is represented not only with a trade fair stand but also with equipment on the demonstration site. From 3rd – 6th September 2014, Liebherr is exhibiting special equipment in Homberg/Nieder-Ofleiden for quarrying. 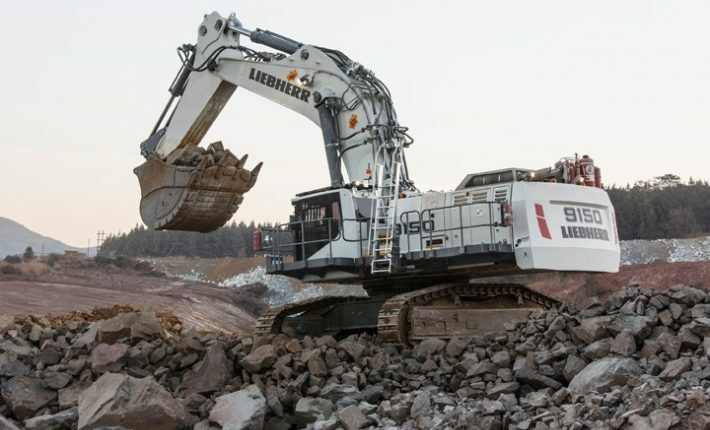 At the Steinexpo 2014, Liebherr is presenting large items of equipment from the earthmoving programme and, for the first time, also the crawler excavator R 970 SME. The attraction for trade fair visitors will also be both large hydraulic excavators from the mining product programme. Visitors can experience the premier of the crawler excavator R 970 SME and the wheel loader L 586, the articulated dump truck TA 230 as well as the large hydraulic excavator R 9150 during a live demonstration. At the Liebherr stand, interested parties also have the opportunity to see the wheel loader L 580 and crawler excavator R 976 HD close-up and find out more about Liebherr. Furthermore, Liebherr is setting up the hydraulic excavator R 9100 at the trade fair site, which is another example from the mining product programme. Liebherr is presenting the mining excavator R 9150 for the first time at a European trade fair. The equipment in the 100 tonnes category (130 short tons) had its début at the Minexpo 2012 in Las Vegas (USA). At the Steinexpo 2014, Liebherr is presenting the successor of the R 984 C as a bottom-dump bucket version with a bucket capacity of 8 m³. In addition, Liebherr is showing the mining excavator R 9100 at the Steinexpo 2014 as a backhoe bucket version, which had its début at the Bauma trade fair in 2010. The 100 tonnes excavator is equipped with a Liebherr bucket with a nominal volume of 7 m³. The R 9100 is powered by a Liebherr V12 diesel engine, which complies with all USA/EPA emissions regulations and, at the same time, guarantees a high level of fuel efficiency. Together with the efficient hydraulic system, the innovative Liebherr V12 engine, which has an output of 565 kW / 757 HP, provides the high breakaway and tear-out forces required. Liebherr components developed and produced in-house safeguard a high level of reliability and consistent performance throughout the entire service life of Liebherr mining excavators. Among the components developed by the company are the electronic Litronic Plus control system, the hydraulic cylinders, the buckets and the V12 diesel engine. This means that fast cycle times can be achieved and productivity can be increased. Thanks to the new engine management system from Liebherr, the performance of the engine can be controlled according to demand. Liebherr crawler excavators are developed for high mining output and fulfil USA/EPA emissions regulations. If lower performance is required during operation, the eco mode makes it possible to reduce the engine load, thereby curbing fuel consumption and lowering CO2 emissions. For the buckets on the Liebherr mining excavators R 9100 to R 9400, Liebherr has developed its own range of Ground Engaging Tools (GET). This means that the performance of mining backhoe and shovel excavators from Liebherr can be further optimised as the self-sharpening tooth design offers maximum penetration forces and high filling capacities. To minimise the stock requirement for spare parts, Liebherr has developed a single standard for side protection panels and corner wear caps, which are fully interchangeable for every model size. At the Steinexpo 2014, Liebherr is presenting the new crawler excavator R 970 SME with wear protected 4.5 m³ bottom-dump bucket. The bottom-dump bucket is equipped with the new Liebherr Z-type tooth system, which features self-sharpening teeth to offer the best penetration over a long period of time. The unit has an operating weight of approx. 80 tonnes and replaces the Super Mass Excavation version of the R 964 C. The R 970 SME is capable of tear-out forces of up to 370 kN and penetrating forces of up to 500 kN. The use of undercarriage elements from the larger R 976 and the increased ballast weight increase the stability of the R 970 SME. In this way, the excavator can be operated with bucket sizes of up to 5 m³. The Liebherr 8-cylinder V-engine from the R 970 SME returns 330 kW / 449 HP of power and complies with the exhaust emission requirements of Stage IIIB / Tier 4i. As well as the standard rear view camera, the newly-developed crawler excavator offers various means of protection for use in quarries. Among these, for example, are the stone impact guard (FOPS and FGPS), ram guard for the cylinders and also protection for the lubrication lines and slewing mechanism. At the Steinexpo, Liebherr is presenting a Liebherr wheel loader L 580 as well as an L 586, which can be seen in operation on the demonstration site. Both machines are specially equipped for tough quarry operations. With the Liebherr wheel loader L 586, Liebherr is presenting the largest hydrostatically driven wheel loader in the world in Homberg. The machine is equipped with a 5.5 m3 rock shovel and tyre protection chains and can be seen during quarrying on the demonstration site. The wheel loader L 586 weighs 31,380 kg in its standard version and achieves a tipping load of 20,430 kg. With a 6-cylinder diesel engine from Liebherr, the L 586 has a performance of 250 kW / 340 HP. The standard equipment of the L 586 includes an automatic central lubricating system. The machine displayed has joystick steering. Furthermore, Liebherr is presenting the wheel loader L 580 at the Steinexpo 2014 with Z-kinematics. The machine on show has a 5 m3 rock shovel with Z40H teeth and segments as well as rock tyres. In its standard version, the exhibit weighs 25,180 kg and has a tipping load of 18,500 kg. Equipped with the 6-cylinder diesel engine from Liebherr, the machine returns 215 kW / 292 HP of power. The Liebherr wheel loaders are distinguished by high material handling capabilities with, at the same time, low running costs. The determining factor for this is the combination of hydrostatic drive with Liebherr’s own-developed electronic map-controlled Liebherr Power Efficiency (LPE) system. Compared with other machines in similar size categories, the innovative driveline concept cuts fuel consumption by as much as 25%.